Cases can be taught in many different ways ranging from lecture to highly interactive formats that often involve students working in groups. Come to a workshop or institute for in-depth, in-person professional development in using Native Cases in your teaching. Our teaching notes provide you with some suggestions, but these are only suggestions, not necessarily THE right way for everyone. So feel free to adapt your approach to what fits your teaching style, your students, and the course expectations. We’ve learned over the years that our cases are used with students at all levels of education. Learn about some of the different ways our Native cases are being used. Contact us if you are interested in sharing your experience. Education is about social and academic development. Much of the literature points to the importance of a sense of belonging and connectedness in Native student success. We think cases are an excellent way of building a sense of community and belonging as students get to know one another and jointly explore the issues cases raise. Human beings are highly diverse and cases can provide an ideal platform for addressing diversity on many fronts. First and foremost, the content of our cases directly addresses issues relevant to an often neglected group of students. Secondly, the pedagogical approaches recommended here provide opportunities for bringing in the considerable community-based knowledge of the students. Third, the case method is an inclusive pedagogy. It is open-ended and inquiry-oriented, inviting a diversity of responses. 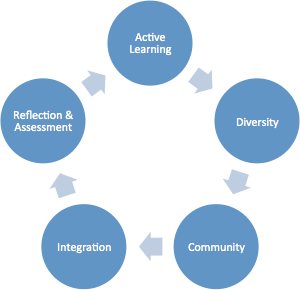 Active learning has long been recognized as a component of effective educational practice. Alfred North Whitehead put it well in saying “ beware of inert ideas that are merely received into the mind without being utilized, or tested, or thrown into fresh combinations.” There are many active learning approaches that go under more specific labels including collaborative and cooperative learning, labs and field student, debate, role playing, small group discussion, seminars, punctuated lectures, project-based learning, problem-based learning, and case-based learning. The common underlying premise of these approaches is that students learn more through educational experiences that involve applying key concepts, working with others, and utilizing knowledge. Assessment activities bring the cycle of learning full circle to answer important questions about what students learned. We also know that reflection at the end of a learning activity deepens the learning process. Teachers build assessment into the ways they do cases in various ways: by asking students to write reflections in response to questions about the case at the end of a case discussion, by asking students to produce analysis papers on cases, by having students fill out surveys about the case and the case discussion, by having students assess the ways their group functioned. One creative approach that our students seem to really enjoy is to have them design an exam on the case!